Mix A Real Man’s Drink! There is no stress in this century that a nice glass of drink can’t fix. Whether it be a celebration or a nice quiet evening out, a few sips out of a nicely mixed drink gives you just the right amount of push to have a wonderful time ahead. With all the inventions wandering around us, you will be surprised how people have also invented so many ways to mix a drink. It is quite fascinating how people can make a few ounces of mix and match drink so tasty. Why don’t you try some of those in your next boy’s night out? Or plan a house party for all the success you’ve been achieving all these years and you didn’t even realize it. Raise a toast with your best of Men and pump up the evening with some of the manliest drinks you’ll ever taste. Cocktails don’t always mean a pink drink in a martini glass and tiny piece of fruit hanging out in the corner. There are some drinks that take a real man to handle its repercussions. Glenlivet single malt whiskey, the name itself creates the aura of class that a gentleman carries within himself. The best of cocktails are made even more heavenly with just a few ounces of the Glenlivet. Try mixing the drink with a few ounces of Carpano Antica Formula. It is basically a mixture of some very old white wine and some few plants and herbs along with some vanilla extracts, processed together for 24 hours. 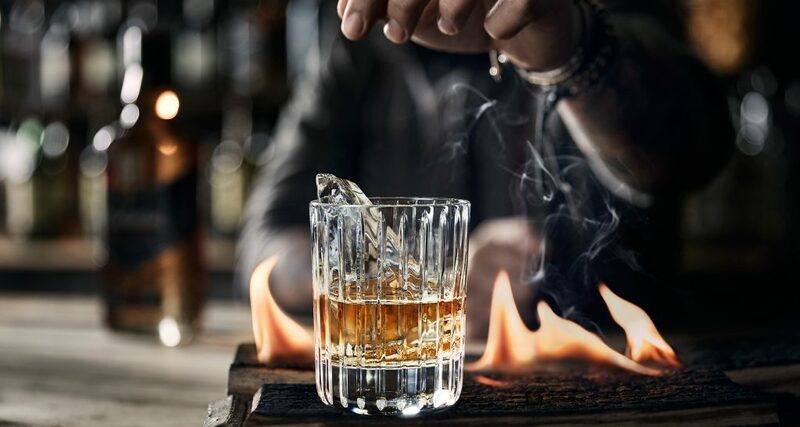 When Glenlivet is mixed with this Antica Formula along with some orange and aromatic bitters, it is bound to satisfy your taste buds to your full satisfaction. Produced with the mixture of 56 different ingredients, the Jagermeister has created sensations among all the youngsters around the world. Interesting fact about this drink is that it was first invented in a vinegar factory which later transformed into a factory of this fascinating alcohol. Even though this drink can be tried in many different ways, the most popular one is “Jager-bomb“. If you are a shot loving person then you’ll definitely love this one. Pour a few ounces of red bull into a nice beer mug and then pour a few ml of Jagermeister into a tiny shot glass. Just before getting ready to dip into the drink, drop the shot inside the glass filled with Redbull and quickly chug it without wasting a second. The next thing you know, you wouldn’t want them to stop coming. Black Label is known to be one of the finest blends of Johnnie Walker. With the blend of 40 whiskies, out of which 35 are single malts and 5 other twelve-year-old grain whiskies. Usually, there is no need for any kind of mixtures to this drink. Just a few ounces of the drink on the rocks and you will feel the smoothness caressing your throat as it passes through. However, you can try sipping in “The Hot Toddy“, after a long stressful day and you will definitely get a bit of a relaxation. Pinch in 2-star cloves into 2 thin sliced lemon pieces and put it in the bottom of the glass. Pour around 50 ml of black label into the glass, add a spoon of lemon juice and a spoon of honey. Finish it by pouring warm water to the drink and a cinnamon stick to garnish it. Stir it well and go for a sip. It will help you with your body aches and the winter breeze. Just make sure not to make a habit out of it. With the mixture of Bulgarian Rose and cucumber, this drink will give you the flavour of freshness with a sweet aroma. Even though people have gradually stopped opting for Gin nowadays, a few sips of Hendricks will make you wonder why though. Make the Gin a bit stronger and try “The Ruby Ruby“. Mix a few ounces of Hendricks with .5 ounce of absolute vodka and a small amount of Lillet Rouge. Add a drop of mole bitters which specializes in ingredients like roasted cacao beans, cinnamon stick, dried oregano leaves and many other interesting ingredients. Try a sip of this cocktail and you will feel your taste buds mesmerized. This ultra premier vodka made from the finest of French grapes individualizes itself by producing gluten-free vodka, unlike the majority of other vodkas. It also comes with a wide range of flavours inheriting almost every fruit that might be your favourite. Usually, men do not prefer vodka as much as women but if you are one then you must try one of the cocktail creation known as the “Hot Mama“. Go for the coconut flavoured Ciroc with a few ounces of watermelon and lime juice. Add a bit of simple syrup and spice it up with a slice of Jalapeno. Satisfy your manly buds with this amazing cocktail and enjoy the evening. Here’s all for your next planned party. 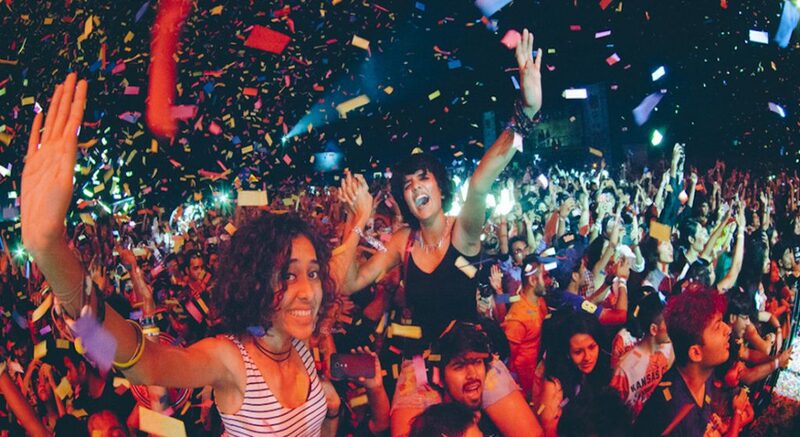 Celebrate a wonderful evening with your friends and do let us know which one made it up to your favourite’s list. We’ll come back with more interesting blogs for you. Until then stay hooked! At Asort we create apparel of the highest quality possible and have enhanced the tastes of Indians by acquainting them with garments of a greater calibre than are found elsewhere. Yet we simultaneously aspire to do our best for the betterment of society when a worthwhile cause presents itself. To create a more benign world there are a few things we at Ifazone are passionate about, one among which concerns AIDS and the powerful impact it has on the lives of individuals, communities, and societies. We are delighted that the first day of December was founded as World Aids Day way back in 1988 as it created a platform using which we can successfully address one of the most pressing issues of our times. To create a more harmonious world we wish to bring to light the latest findings concerning AIDS and to shatter unfounded yet prevalent perceptions commonly found in society about this disease. 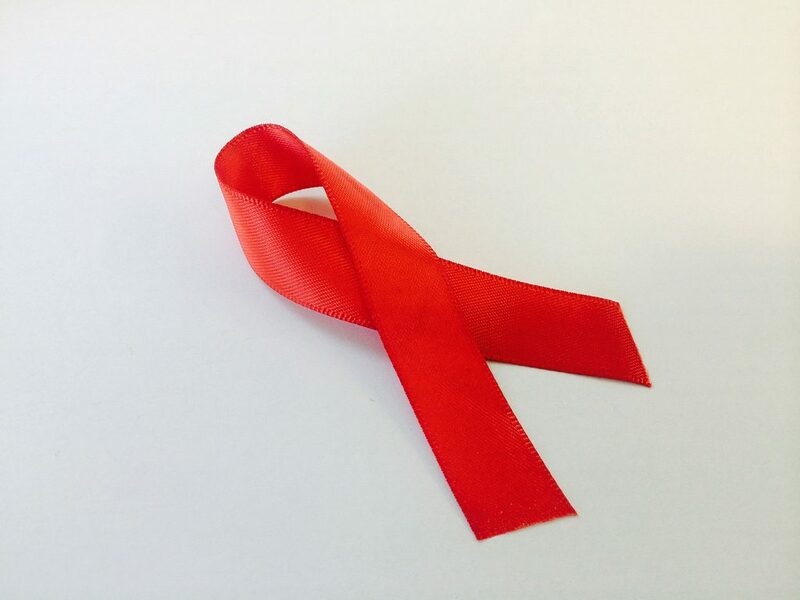 AIDS is caused by the HIV virus and it was identified less than 24 years ago in 1984. If someone is infected with the HIV virus it doesn’t mean that they have AIDS, someone can be infected with HIV but not have AIDS for a number of years if ever. Across the globe today, nearly 37 million people are living with the HIV virus and nearly as many have died due to AIDS since the disease was identified in 1984. Many of those who are living with HIV and AIDS face a great deal of stigma from a society which elects to shun social interaction with such individuals. In many cases, close relatives also turn their backs on members who have been infected with HIV. Many individuals who have been infected with HIV have to deal with the double blow of living with a life-threatening and potentially fatal disease and having to face social ostracism. Such immense difficulties often lead many infected with HIV to develop additional problems such as poor mental health. Often the perception of those who have contracted the HIV virus is that they lead immoral lives and this perception leads to such individuals being unable to find employment which would allow them to earn a livelihood. Additionally the perception that AIDS is a highly contagious disease results in many people, many of them well educated, refusing to work alongside those they know to have the HIV virus. Those who have AIDS are perhaps the greatest victims of societies ignorance and precisely at the time when they most need societies to support, it turns their backs on them. At Asort we believe in the universality of men and strive to empower those who we feel are being treated unfairly by society. AIDS is a disease that does not discriminate between social class, religion, educational achievement, employment status, or gender. As difficult as it may be to accept, anyone can contract AIDS even thru no fault of their own. Many still remain ignorant as to the fact that many of those who have contracted this disease are still able to lead healthy, fulfilling, and joyful lives. For instance, the star of Three and a Half Men and one of the biggest stars in Hollywood, Charlie Sheen, is infected with the HIV virus. However, thanks to discoveries made by the latest medicine he is able to lead a full life and enjoy fulfilling relations with members of his family and with society. Over the past few decades, numerous advances in medicine mean that AIDS may no longer be as deadly a disease as it is still popularly perceived to be. There is more reason for cheer, in India, while slightly more than 20 lakh individuals are currently infected with HIV, the spread of the disease has slowed drastically over the past few years. At Asort we believe that all individuals, regardless of any shortcomings, deserve to be treated with dignity and we are striving to create a world that is free from bigotry, racism, and other social ills that rob men and women of their dignity. Despite the stigma associated with AIDS, it is no longer the cul de sac to live it had been in the past. Recent advances in medicine have made it far more likely that those infected with HIV will continue to live long fulfilling lives without developing AIDS. Antiretroviral treatment, which slows the rate at which HIV copies itself inside the human body, has been available in India for nearly 13 years. Such drugs lower the HIV count to the point that HIV cannot be detected using a conventional blood test. While the war against AIDS is far from finished many small battles in the fight for the rights of those infected with HIV have been already won. For instance, nearly four years ago an HIV/AIDS bill protecting the rights of those infected with AIDS was passed. This bill ensures the right to privacy to those infected with HIV/AIDS and prohibits discrimination against them in the realms of gaining employment and protection against termination, allows them to buy insurance, and offers freedom to travel using public transport. What is the best thing about owning your own bike? Could it be the sense of freedom you experience when you’re riding on your two-wheeled stallion? Or the extra attention and envious glances that begin to come your way? An increase in the sheer number of possibilities that become open to you? Or maybe simply the opportunity to travel to places that you could earlier only have travelled to by hitching a ride on someone else’s ride? Most probably, the best reason for owning your own bike is all of the reasons given above as well as some special ones unique to you. What is true for every man is that we love our bikes! Even if the bike we own isn’t a Harley Davidson or high-end Japanese model, we’re still in love with it, it’s our first love and we’ll remember our first bike even when we’re 40 years old by when we have bought, used, and sold several bikes and cars. If money were no object, you would probably opt for the snazziest bike which would cost upwards of 10 lakhs and give poorer mileage than large four-wheelers. Money, however, is of prime importance when we decide to buy a relatively expensive item like a two-wheeler. Thankfully today’s bikes that are priced below 2 lakhs still come with numerous attractive features that were available in only much more expensive bikes only a few years ago. Although we agree that there is a significant gap in the features available in a bike costing between 50K to 100K and one priced between 100K to 200K, yet bikes priced between both these price ranges have numerous similar and attractive features. For instance, most bikes that cost more than 1 lakh rupees will have a 6 gear transmission which is also common on bikes that are priced slightly below 1 lakh rupees. The advantages of that 6th gear should not be overlooked, too many bikes in years gone by provided unnecessary suffering to their owners who felt the need for an additional highest gear. If you are going to buy a bike that costs up to to 2 lakh rupees you should certainly expect to have a ride that has 6 gears. Additionally, long gone are the days when vehicles, cars and our beloved & best bikes in India included had tire tubes, tubeless tires today are as commonplace as, well, tires with tubes used to be. This doesn’t mean that tubed tires are a rarity because they are still found in some of the lesser expensive bikes, but the ease offered by tubeless tires means that they are the preferred choice by young bike enthusiasts. We recommend that even if you are on a tight budget when it comes to spending on your bike, you must ensure your bike has tires of the tubeless variety. We also remember how even a little more than a decade ago the tires on most mass-produced Indian bikes had spokes and only costlier superbikes had the coveted alloy wheels. How far we have since, today huge numbers of mass-produced Indian bikes come fitted with alloy wheels. Alloy wheels’ weight less than spoked wheels meaning they have a lower unsprung weight, that is the weight put on the suspension of the bike and is of particular importance when the bike moves over uneven surfaces and leans when turning corners. 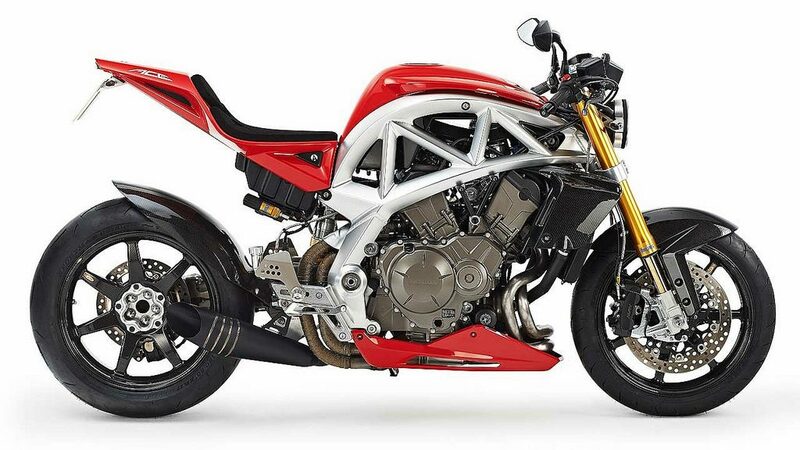 The lower the unsprung weight the less load there is on the bike’s suspension and hence the bike does what you want it to do, namely, accelerate, brake, and turn corners better. Thankfully alloy wheels are no longer confined to only the realm of superbikes as they are easily available on bikes that are priced less than even 1 lakh rupees leaving aside their ubiquity in bikes that cost between 1 to 2 lakhs. Lastly, although many old-school bike lovers love analogue dials, the later generation of millennials want digital technologies to provide comfort in their lives. Our generation wants our motorcycles to be one with the age of seamless interconnectivity brought forth by smartphones and 4G networks. Hence digital speedometers, odometers, and tachometers are widely popular and important features on newer bikes. Any new bike you decide to purchase should have a digital footprint as, more likely than not, you have grown up surrounded by technology and are far more comfortable with it than is Generation X or even older millennials are. We admit we can’t tell you what bike is precisely the right one for you because that’s entirely subjective and the sheer number of models that fall under the 2 lakh price range is vast. However, we are offering you a guide to what your newest bike simply shouldn’t be without, everything else you decide your bike must have will be pure gravy. Do not have the time or money to go to gym? Follow our home ab workout below and you will see great results. These abs exercises will help you to strengthen the whole core and burn belly fat at the same time. Lie on your back facing up along with your hands behind ears and legs extended. Raise your legs about six inches off the bottom. Use core and raise shoulder blades off the ground sort of a crunch whereas also pull knees in toward chest. Careful to not pull on your neck to crunch; use abs to raise. Reverse the movement to come back to beginning position. Lie with your face up while fingertips behind ears, and bent your knees at a 90-degree angle with each foot off ground. Raise your head and shoulders off the mat. Bring your right elbow to your left knee as you extend right leg out straight. Quickly reverse the movement to repeat the same on the opposite side with the left elbow to your right knee. Keep repeating on alternate counts. Stand tall with feet and hip straightly aligned. Interact with your core and use your lower abs to lift one knee at a time as if you are running. Bring knees to an aligned height as your hips with your thighs parallel to the ground, and keep in mind not to lean back. Continue standing with your feet flat on the ground and repeat with your alternate legs. Lie down with your face up and arms beside you. Bend your knees while keeping your hips and knees at a 90-degree angle, your core engaged. Activate your lower abs to raise your hips off the ground and slowing bring your knees towards your chest. Then gradually lower your back to your starting position while keeping your lower abdominals still engaged. Start your position with a high plank while keeping your core tight and hands directly aligned with your shoulders. Keep your core engaged to stabilize your hips as you slowly move your right knee towards your chest. Move the same leg back to the starting position then repeat the same with your left knee. Continue with alternate legs to pump your knees as quickly as possible. Lie down with face up and hands straight beside you as your body forms a T position and extend your legs. Raise your legs towards the ceiling till they’re perpendicular to the ground. Make sure not to lift your head or shoulders off the mat, lower your legs to the right as much as possible while not losing your form. Reverse the movement while doing the same towards your left. Repeat the same towards alternate sides like windshield wipers. Lie with your face up and arms beside you. Interact with your core and slowly raise your head and extend your left hand to touch towards your right toe while also lifting your right leg keeping perfectly straight. Try to reach as far as you can and then come back to your starting position and repeat the same with the other side as well. Finish your session with a strong isometric hold. Lie down with your face up and arms beside you. Try to engage your abs. Lift your head along with your shoulder blades and straightened legs off the ground, keeping your lower back intact with the mat throughout the complete exercise. It becomes more difficult the closer you keep your legs to the mat. Hold this posture for complete thirty seconds and release. Beards are in, Hugh Jackman sported one in his latest X-Men film, as has Ranveer Singh for an upcoming film. Yet while for many men growing beard may be easy, their maintenance and upkeep tend to be slightly more difficult. A few must-have accessories and products to help you manage and beautify your mane are described below in detail. A beard comb is a must-have tool for anyone who has decided to grow a beard. Yet before you dismiss a beard comb as an unnecessary and frivolous accessory, think again. A high-quality beard comb is not only ideal to style your beard but is in itself a fashion statement. Ensure that any beard comb you buy is not made from cheap plastic but rather is made from more exotic materials such as cellulose acetate and has smooth cut teeth that have rounded edges. 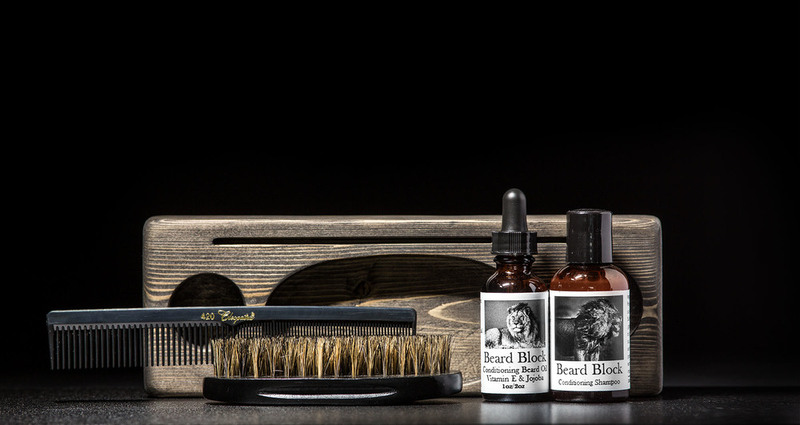 A good beard comb should also clear one’s beard of dust when its used and lead to the release of natural oils. Many experts on the subject of beards have stated that the ideal beard should look groomed and shiny, not shaggy and dusty. Unfortunately, many of us men who are eager to sport a beard haven’t the faintest idea how to maintain the ideal beard. An essential ingredient needed to maintain a perfect beard is beard oil. This oil helps to tame your facial mane while hydrating the skin beneath the hair all the while softening the hair on your beard as well. If you’ve decided to grow a beard, chances are you will need to use beard oil for the regular upkeep and maintenance of your beard. Another can’t do without ingredient to maintain the perfect beard is called beard wax. This wax is useful when you want to maintain your beard or moustache in a certain style or shape. You should select the right beard wax for yourself based on how you are going to be wearing your beard or moustache. The texture of your beard plays a part when you select the beard wax and so does the style you opt for. For instance, if you want a moustache with twirled up whiskers then you will probably need to use a beard wax that has a medium to strong holding strength. Remember that beard wax tends to build up wherever you apply it and so you must wash off the beard wax at the end of the day. Why does a man need a beard shampoo instead of a regular shampoo? Read on to find out the answer. Every hair follicle on your face at its root has glands known as sebaceous glands that secrete sebum oil without which your beard will frizzled out, become dry and likely break and have split ends. Whereas the regular shampoo you use on your head will remove ingredients such as sebum oil that is necessary for your beard to look its best, a bread shampoo leaves the sebum oils in your beard untouched leading to a fine looking beard. This is why you need a beard shampoo for your beard instead of the regular shampoo you use on your head. Lastly but not least importantly is a vital ingredient to maintain the upkeep of your beard known as beard soap. The reason that it should be used on your beard instead of the regular soap you use on your face has to do once again with sebum oil that’s secreted by your sebaceous glands. A high-quality beard soap will not only not strip away precious sebum oil from your beard but will actually contain carrier oils that are good for your beard. Such carrier oils are derived from seeds and nuts and are similar in function to the sebum oils naturally produced by your body. Hence a good beard soap will actually soften your beard and is essential to maintain a good quality beard. So all you manly men, remember if you’ve read this intently you may consider yourself lucky because it’s not every man who can grow a beard. Those who are flirting with growing a beard should try and follow our advice as closely as possible the end result of which will be a gorgeous lush beard that is impressive to you and to those around you. 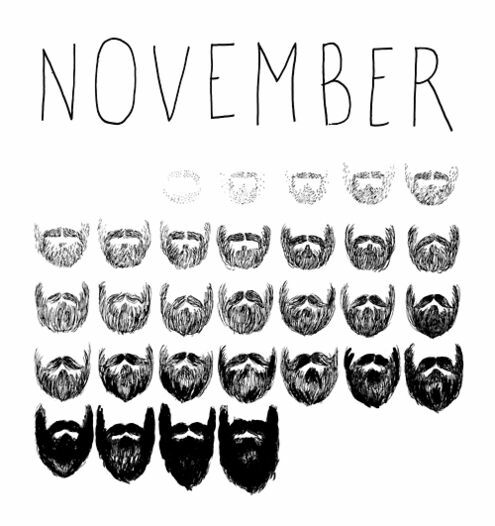 With the month of November knocking on our doors, the men from each corner of the world are preparing for a look trend called the “No Shave November”. With start of the month of November, all social media platforms will overflow with the hashtags and posts from men who don’t only will to keep up with the latest trends but also believe in raise awareness for the causes worth knowing about. Before you get ready for this challenge/campaign and start browsing your internet to choose the look you want after you grow your beard, let us walk you through the real origin behind why this whole thing started at the first place. No-Shave November is month long journey amid which members swear off shaving and grooming with the end goal to raise awareness among the people about prostate and testicular cancer. Take in more about how you can also get engrossed and start getting hairy for a whole month. Men from all around the world spend very small amount of money on grooming and shaving their beard everyday. Those few bucks may not mean anything to the man spending that money for his beard but it might mean a lot to someone who is fighting the battle of life. This purpose of “No Shave November” started off with an intention to spread awareness among the people about prostate and testicular cancer. One out of seven men is suffering from prostate cancer and there is very little that we can do about it. Thus this whole campaign started with the intention of doing the very least possible, i.e, to save a few bucks from not shaving for a whole month and donating that money to organizations who help men fight prostate cancer. Your least can mean the most to them. However, whether to donate money is your choice. No one can force you to give away some amount from your hard earned money but the important part is to let people know. The main purpose of this movement is to educate about cancer prevention, save lives, and aid those fighting the battle. Growing a long beard grabs attention and you can make good of that attention by spreading the awareness to the society and fight for men’s health. 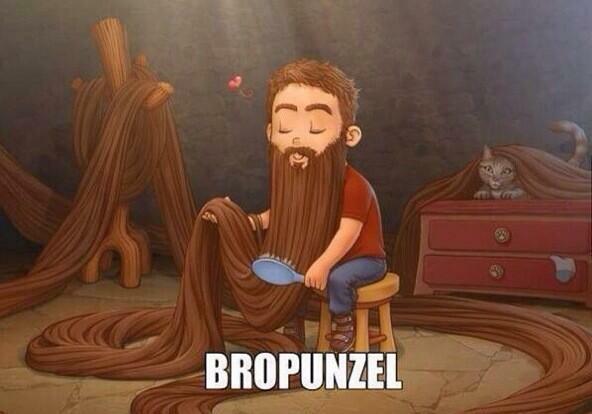 Take it in a fun and casual way, grow your beard and style a new look on you, but do it for a good cause. 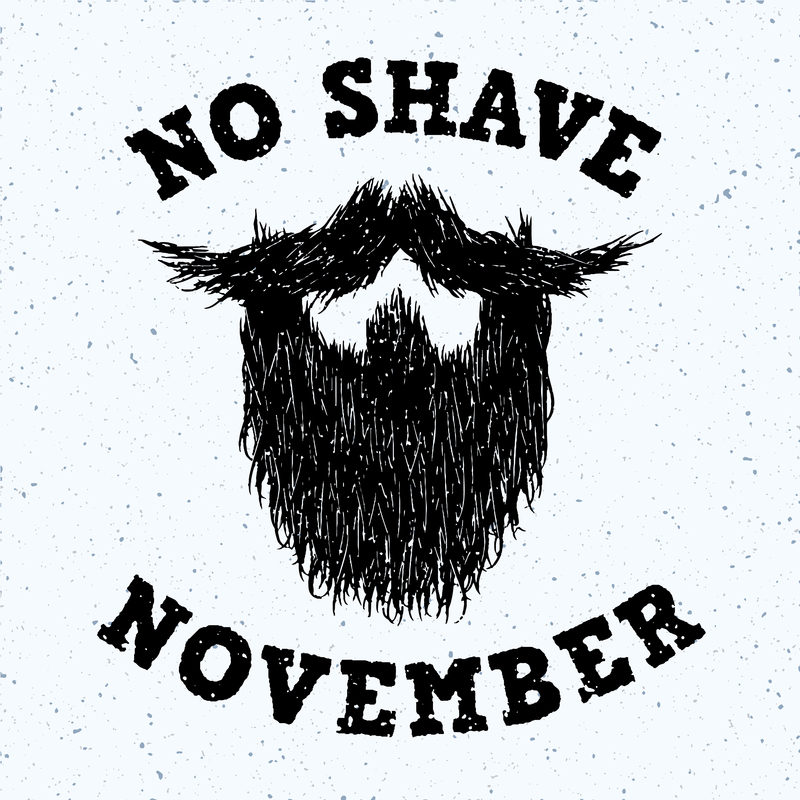 Put down your razor for a month and donate that amount to someone who needs it more by setting up your own personal No-Shave November fundraising. If you’re not ready to get hairy, sit back and support someone who is! Brighten up your celebrations this Diwali by trying something innovative, here we have some low budget out of the box diwali decor ideas. Diwali decorations are incomplete without putting toran at the entrance. Usually torans are made of flowers and mango leaves to set the festive mood and welcome guests. We have interesting DIYs to make your house standout without burning a hole in your pocekts, all you need to do is open your art treasure and use stuff lying out there to create torans. Use beads along with pom poms to create these pinspired torans. This time make your Diwali dinner a memorable one by redoing your dining table. Take inspiration from this tablescape and use lanterns and candles as the center pieces. Add flowers around it for an added elegance. If you want to style lanterns in the conventional way, we still have appetite for the hanging ones. Instead of traditional lanterns use tinted mason glass jars and hang them using jute or coir rope with fairy lights coiled around it. Add tea lights or low watt bulbs to light it up. 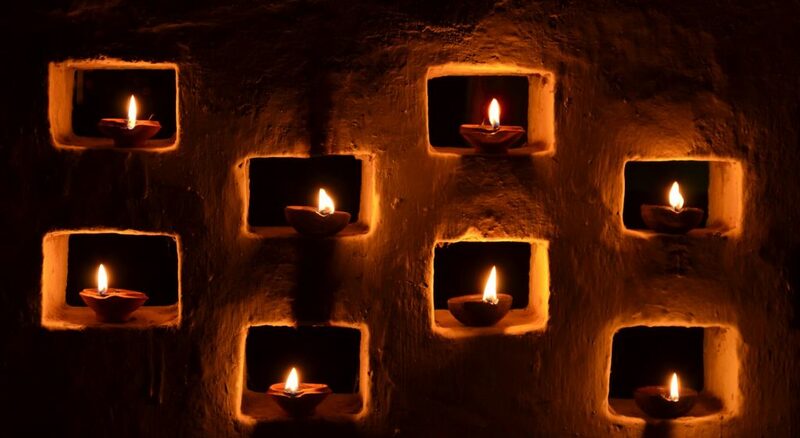 If you are up for some DIY this diwali then we have quite interesting ideas. You can make you own personalized diyas out of colorful glass bangles, marbles or sea shells. You can use waste bangles also for this DIY. Stick a stack of 12-15 bangles using fevi stick, you can arrange it as you want. Similarly you can arrange marbles but marbles you need to use a stronger adhesive. Add tea light to it and light it up for a beautiful decoration piece. Sea shells can also be used as diyas by filling them up with wax. No need to light up your house in the same old way with floating candles in crystal bowls. Instead use floating single tealights in a glass of water or jar, it puts a spin on things and looks just precious. You can use flowers, glass beads etc to achieve this look! Hope you guys liked our diwali decor curation, would love to know how you are decorating your home this Diwali!